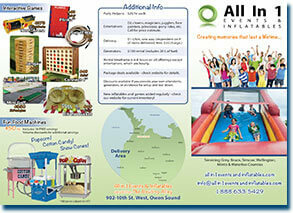 John Donald Gordon Schnurr, owner of All in 1 Events & Inflatables, is a young man who grew up in Bruce County, Ontario. During his childhood (before computer games became the norm), John loved to explore and create his own adventures. Living in a rural area meant that there weren't many friends who lived nearby, so when an occasion came to play or attend a birthday, he was always eager to attend and have fun outside, no matter the weather conditions. John attended the University of Guelph, receiving a Bachelor of Commerce specializing in Hotel and Food Administration. After graduation, he worked in fine dining and realized that he enjoyed cooking more as a hobby than as a career. He moved to Toronto, finding a job in the party rental business. Working his way up the company ladder from shop cleaner, to deliveries, to Warehouse Manager, to Director of Operations, John got to know every aspect of running a top-caliber party rental company. Realizing that there was a demand for event planning and inflatable rentals outside of the GTA, John opened his first business in 2015, catering to Grey and Bruce Counties and beyond, including Guelph, Kitchener/Waterloo and Cambridge. He now also runs The Bowling Alley in Owen Sound, which features carnival games and inflatables alongside other attractions such as pool tables, arcade games, a licensed restaurant and, of course, bowling. 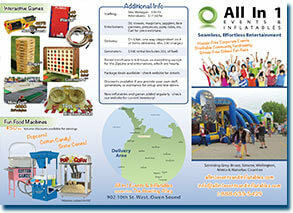 The location also serves as the warehouse for All in 1 Events & Inflatables.